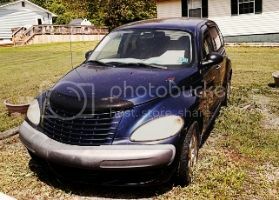 Anybody Considered Going REALLY Old School on a PT Cruiser? With all the posts about folks that can't get their PT to run due to PCM/sensor issues or having the wrong engine/PCM combination, it started me wondering if anybody has every tried or even though about just chunking all the electronics and going completely old school. First, has any manufacturer ever made a distributor or stand-alone ignition module for the 2.4 engine? It appears that all that would be needed is a magnetic pickup coil with vacuum advance that would mount in the position of the crank sensor. This could drive a $20 GM HEI ignition module that would fire the existing spark-waste ignition coil as long as this PT coil has similar resistance and power requirements as a standard HEI coil. For me, I would likely start with parts I already know such as a mid-1980's Chevette distributor base and remove two of the four lobes from the pickup star. Then it's all just machine work to fit the shaft and flange to the PT. But there are many ways this same thing could be accomplished. After the ignition was taken care of, it would just be a matter of finding the right side-draft carburetor to mount in place of the throttle body. Stromberg, Webber and SK all make potential candidates. Pick one that fits on an engine with similar displacement and it might work just fine. You would also need some kind of flange adapter and a $50 low pressure electric inline fuel pump. Has anyone here ever done anything like this? Or is a kit already available to do this? PS: As a side note, PT owners that are also survivalists might be interested in something like this with standard points in the ignition and a mechanic fuel pump. That might allow them to keep cruising in the post-apocalyptic world after the nuclear EM pulses destroy all electronics. Last edited by Handy_Cruiser; 14 Dec 2013 at 11:00 am. 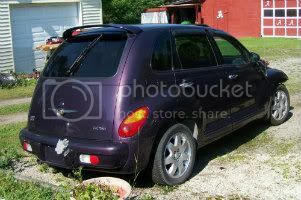 Re: Anybody Considered Going REALLY Old School on a PT Cruiser? I think this is first - I agree! Why would you want to go back to poorer engine mechanicals? A carburetor? SERIOUSLY? I don't miss them. You'd get worse drivability, worse mileage, and probably couldn't pass emissions. Are you sure it's worth the risk! There are quite a few things that have been done. 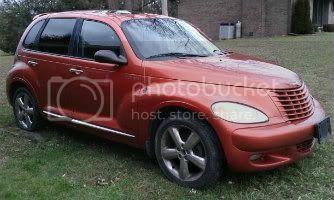 Hemi V8 RWD, V6 RWD, 4-wheel drive jacked up off roaders, etc. But the 2.4 turbo responds so well to bigger turbos and higher boost so that's where most of the creative juices have gone. No one that I know of has down graded to old technology and the resulting lower performance you would get. There are some fuel control/boost control devices around, especially from 12 years ago, that were used for tuning modified engines. But they were state of the art at the time so they shouldn't be considered "old school". I would wait until after the apocalypse before patching together a Mad Max, Frankenstein. Handy; in many states you wouldn't pass the emissions test, and not be able to register your car. It would cost mucho buckos to machine adaptors for the distributor and mechanical fuel pump. Besides, who would want to take over the USA? Russia doesn't want our debt. China won't get their money back unless we keep buying their crap. And the aliens haven't been around since the 1950's. Motorhead and Teska like this. WARNING:True but facetious response below. All provided in good-humor as is this entire post. While truly interested if anyone had actually attempted this, I only posted this in good fun. Serious responses are not required unless you have knowledge of this actually being done. I never even thought about those poor lesser states where cars have to be inspected and the emission output checked before registration is granted. Where I live, I just go down and wait in line to see Susan. All Susan wants is last year's registration, an insurance card from Greg down the street, and this year's personal property tax assessment with Bobby's stamp showing where I paid last year. If I forget any of these things, Susan usually just gets on the phone and calls one or more these folks to see if I'm "all good" or not. Then she tries to talk me into buying a higher-priced "Game and Fish" tag so some of the money will go for hunting and fishing. I usually remind her I already have a "Duck Unlimited" license tag. The price of that tag also covers my annual membership to Duck Unlimited. Then I write her a check and she gives me my registration stuff. Ne'er does what comes out the exhaust pipe play any part in this transaction. Vehicle registration in my state are more about hunting and fishing then about automobiles. But I morn for those in states with unclean air that have to worry about such things. Last edited by Handy_Cruiser; 15 Dec 2013 at 03:06 pm. Sounds like someone is backpedaling to me. We all ask dumb questions sometimes, even me, so just own up to it.